Fabric glue is one of the best choices to mend your clothes or even to make a brand-new outfit without sewing. Fabric glue is not produced just like ordinary glue. However, it is specially made for bringing two fabrics to stick together for a long, long time and sometimes permanently. Fabric glue can be used for upholstery, clothes, felt, carpets, automobile fabric repairing, sports kit, shoes etc. They have a strong sticky bonding with fabrics that makes sewing unnecessary. Most of these fabric glues are very easy to use and dries very fast. Some of them are washable, and you can again wear your clothes. You can design your clothes by sticking gems, sequins or beads. The glue can be used for furniture fabric (cushions, seat covers), and is also good to be used with leather. There are a huge number of fabric glues available in the market, you need to select the best fabric Glue of 2019. We have collected some information on the 10 best types of fabric glues, you can shop online. This latex-based fabric glue is made up of non-toxic compounds, which are environment-friendly. Its powerful bonding formula let the glue stick instantly to the fabric and dries quickly. Bish’s Adhesive Tear Mender is good to use with clothes, cushion covers, sporting stuff, leather, tents, awnings, boat covers and much more. Water-proof – Its long-lasting and durable formula has a water-proof property that does not easily dissolves when comes in contact with water. Washable – It is easy to wash in washing machine and good for dry cleaning without weakening the bond. Quick Drying – It dries so fast and becomes flexible after drying. It instantly sticks and dries with the fabric just in 3 minutes. Permanent Bond – It creates a permanent bond by settling into the spaces of the fabric fiber. Easy to Clean and Use – The glue is not adhesive to a solid and rigid surface and does not harm skin. You can remove from the hands by rubbing the glue with the help of fingers. It is easy to clean from hands or any other hard surface. Environment-Friendly – The formula of the glue is produced from natural resources like latex and other renewable materials, which makes it environment-friendly. Its water-based formula is UV resistant. Beacon Fabri-Tac is an amazing permanent fabric glue which is suitable not only for fabric but it is also used to mend other materials such as glass and wood. However, it is best to use with fabrics like leather and lace. It provides durable bonds with fabrics and does not deteriorate them after drying. Instant Drying – It dries rapidly just after its application as compared to other types of fabric glues. Applicable to various materials – It can be used to repair light as well as heavy fabric. And a variety of objects can also stick to it like wood, lace, pearls, beads, ribbon, glass, clothes, crystals, picture frames etc. Easy Handling – Beacon Fabri-Tac comes in a squeezy bottle which is very easy to hold in hands, and easy to use with its applicator tip. Acid-Free – The adhesive is acid-free; hence you can use it easily by hands. It does not leave stains on clothes. No Soaking in Fabric – It’s one of the outstanding properties is that it does not soak into the fabric and stick permanently to it. Odif USA 505 is a fabric glue that comes in a spray bottle. The adhesive bond with this glue is strong but temporary with the fabric. It is also adhesive to several materials like paper, batting, chipboard etc. Machine Embroidery – It is suitable to hold stabilizers for machine embroidery, quilting, and applique. Removable with Wash – It can be easily washed off with water and soap. If you want to remove the glue, the fabric can be easily washed by hands or machine and suitable for dry cleaning. Odorless – It does not contain any pungent smell which can irritate eyes or nose. The spray is non-misty. Non-Stiff – It does not become stiff or hard after drying. Easy to Use – Due to its convenient spray bottle, it is very easy to use. The hands remain clean and glue-free. And you can easily apply to any portion of the fabric at any position. Eco-Friendly – It does not contain fluorocarbons which makes the adhesive eco-friendly. Its powerful sticky formula bonds permanently with various types of fabrics. It can be used with a number of different materials like sports kit, clothes, furniture fabric, tents, tarps, leather etc. Bish’s Original Tear Mender is widely used and highly recommended by the customers. Fast Dry – It dries faster than most of the other strong adhesives. It just takes 3-5 minutes to dry completely and make a permanent bond. Flexibility – It becomes flexible and stretchable after drying. It does not remain stiff when applied on fabrics. Able to Wash – It is suitable to wash with hands and machine, even it can be dry cleaned. The bonds are so strong that it does not weaken. You can wear clothes easily after wash.
Non-Flammable – It is easy to use anywhere because of its non-flammable property. It is non-toxic too. Produced by Natural Materials – It is manufactured with natural stuff like latex and other natural raw materials. Natural substances make it environmental-friendly. Cleanable – It is very easy to clean and use. Easily comes off of hands. It can be wiped off easily from hard surfaces. 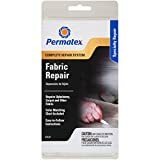 Permatex 25257 is the best choice to repair automotive upholstery, furniture, clothing, and carpet. It comes in a handy spray container through which you can easily apply glue to the corners of the car where your hand cannot reach easily. Automotive Repairing – You can repair many parts of the car such as, the floor mat, roof fabric, dashboard, seat covers, and can also be used on some exterior parts of the car. Handy Container – The bottle of the spray is so easy to use. Just shake the container before use and press down the nozzle directed towards the repairing part. Suitable for High Temperature – It can be used for outdoor projects standing at high temperature like 170 °F. Resistant to Humidity – The adhesive is resistant to water and humid weather conditions. It can also be used in aquariums. Repairing Kit – The repairing kit contains 7 fabric repair cups in different colors, 2 fabric air-dry cups, application spatula, mixing bottle, screen applicator, and color matching and instruction cards. This fabric glue is best for clothing fabrics like cotton, jersey, denim, trims, flannel, and ribbon. Its unique property is quick drying – it dries faster than any other glue of its kind. It is way more rapid and easier to use than sewing. Stretchable – It remains stretchable and flexible after drying. Even after washing the glue does not get stiff. Good for laundry – You can wash the fabric after the application, the glue won’t come off, it will remain flexible. Hence, it can be washed off with water and soap before drying. You can remove the excess glue with slight washing just after it dries up. Well Designed Bottle – The bottle of the adhesive is very easy-to-use. You can hold it comfortably by hand due to its small size. The efficient applicator tip of the bottle dispenses the glue easily and there are fewer chances of wastage. The bottle comes with a cap to cover from the top which prevents the glue from drying. Non-Toxic – The glue is safe to use because of its non-toxic property. It does not contain any harmful substances. Odif USA 6-1/2-Ounce 606 Spray is able to fuse with fabric and paper. It is a new-sew glue and great for quilting, applique, and machine embroidery. It is best to use with fabric stabilizer for embroidery. Adhesion – It is adhesive to various fabric material and makes a strong bond with paper and fabrics. It can also adhere to paper permanently to fabric. Good for Machine Embroidery – It fuses with paper and fabric stabilizer and makes machine embroidery and quilting easy. Washable – You can wash your clothes without any fear of dissolving the glue. This adhesive is water-proof. Easy-to-Use Spray Bottle – The spray bottle of the adhesive is very convenient to use. You can spray easily to every portion of the fabric or any other place where you can not apply glue with hands. Fabric-Friendly – Odif 606 spray is suitable for various fabrics and does not deteriorate them. Its odorless property makes its fabric as well as environment-friendly. Dritz 401 is a glue stick that is and water-soluble acid-free glue. It is best for basting while sewing clothes. It works perfectly to hold down the fabric from moving during stitching. Non-Toxic – this glue is completely non-toxic and safe for your fabric as well as for skin. It causes no irritation when comes in contact with your skin. Water-soluble – Its water-soluble formula can easily wash off from the fabric before the glue dries. Storage – Always keep it in the refrigerator after use to prevent it from drying. Usage – The glue stick is very to easy to apply, just remove the cap, twist its base (the glue will come up), and apply to your fabric. To close again twist the base in another direction and cover it. Instant no-mess bond - bonds paper, cardstock, photos, tissue paper, ribbon, and other light materials instantly. Just press and roll - push the wheel down and roll to apply the strong, permanent double-sided tape adhesive. Safe for your photos - this acid-free glue runner is perfect for scrapbooking, photo albums, card making and much more. Perfect for the office - seal Envelopes easily without licking, and use to stick your notes anywhere. Take it anywhere - small and convenient, this tape runner comes with a cap for easy transport. 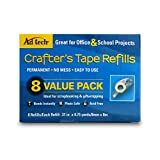 AdTech 05674 Tape is ideal for gift wrapping and scrapbooking. It is very easy to use with no mess of liquid adhesive onto your project. You can easily make your school projects, make albums, cover your books and gifts and much more. Instant Bond – AdTech Crafter’s Tape instantly bonds with paper, photos, cards, ribbon, tissue paper, and very light fabrics. No Mess – This tape works so smooth and clean having no liquid mess with your objects. Easy Taping – You can easily use this tape by pressing the button and push down the wheel and roll to apply the sticky double-sided tape. Safe – It has no toxic material present in this tape. It is safe for your school projects as well as for office use. It causes no harm to skin or to your project material. Convenient Size – The tape comes in a small and user-oriented packaging which is very easy to carry it anywhere. Refill – it can be refilled easily, just open the cover, take out the cartridge and fit the new tape. 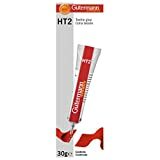 1 New Tube of Gutermann Textile glue. Ideal for cotton, denim, linen, felt, wool, ribbon and many more. This glue is the perfect adhesive for creative projects. Can be heat sealed similarly to Hem-It. It is adhesive to almost all types of fabric material. It forms a very strong bond that doesn’t need to stitch the fabric. You can also use to with other materials for decoration and other projects. Strong Bond – It creates a permanent bond with linen, cotton, felt, wool, denim, and many other fabric types. Embellishment – You can decorate your house’s decoration fabric items, such as furniture, seat covers, ribbons etc. Heat Drying – This glue takes a bit more time to dry on its own. It is better to heat it for making a strong bond and quick drying. Washable – After complete drying this glue makes an excellent permanent bond which can be machine washed and even dry cleaned. It is water and heat resistant and the bond does not weak when comes in contact with it. Q. What is the strongest fabric glue? A. Bish’s Original Tear Mender Instant Fabric & Leather Adhesive is the best choice for fabric. It creates super strong and permanent bonds with almost all types of fabric material. You can also use it on other stuff like sports kit, furniture, leather, tents, boat covers, and awnings. After drying it completely sticks to the fabric and can be washed in the machine as well as it is good for dry cleaning. It is water and heat resistant, and the bond does not get weak if it is contacted with these things. Q. What kind of glue is best for fabric? A liquid glue with non-toxic substances is better to use with fabric which does not deteriorate it and can be washed easily. Aleene’s Fabric Fusion Permanent Fabric Adhesive is ideal for fabric stuff. You can use this glue on any types of fabric, and it will form a permanent bond with it. It does not dissolve on washing and remain flexible after drying. You can even decorate your clothes with beads, pearls, a button with this adhesive. Q. How do you remove dried fabric glue from fabric? First, remove the excess glue by scraping with the help of knife, blade or any other hard object. Warning: Do it carefully – Do not cut your hands or the fabric. Then soak the fabric in water so the glue might get loosen. If soaking in water is not enough, then wash it in hot water. The water should be bearable for the type of fabric you are washing. Then dry the fabric completely. If the stain of the glue is still left, then again soak it for half an hour in cold water. Then using the detergent or dry-cleaning soap, rub it with a sponge and rest it for about 5 minutes, then rinse and dry. Q. Is Gorilla Glue good for fabric? A. No, Gorilla Glue is very strong for fabric. It can deteriorate your garments by burning or making holes into the fabric. Gorilla Glue is best to use with hard objects for different outdoor and indoor projects. It is suitable for materials like metal, glass, wood, concrete, ceramic etc. Q. Can I use fabric glue instead of sewing? A. Yes, absolutely! Fabric glues are the best option if you do not want to sew your clothes. You can easily apply these glues onto your fabric let it dry and just in a few minutes, you are ready to wear your clothes. These glues are specially designed for fabric, it joins the fabric materials together quickly and easily. There is no need to sew your clothes because it is time-consuming, and it needs skills too. However, fabric glues can be used by anyone – no skills needed, and it also saves your time. Q. What is a good substitute for fabric glue? A. Bonding tape is an alternative of fabric glue. These tapes are fusible with fabric, they stick tightly to it. The strip of this tape melts down on heating and makes a perfect bond with your clothes. They are best to use with cotton and other fabrics that can bear the heat. It is also washable in the machine and can also be dry-cleaned. It is also easy to use as it does not get messy as other fabric liquid glues are. It remains dry and sticks quickly by ironing the fabric, leaving no mess. A huge number of fabric glues are available in the market and online. Some have good adhesive property, some dry quickly, some are washable, flexible and so on. So, you need to consider some qualities and properties of a fabric glue before buying the one – either which one of them possess the maximum qualities. Melting Level – Always make sure that the melting level of the fabric glue is low for the soft fabrics. If you use the hot glue it can destroy the fabric. Its melting level should be considered according to the softening of the fabric. Strong Bonding – The glue must be purchased according to the respective fabric. If you use irrelevant glue on any type of fabric, either the glue will not stick properly, or the fabric will be distorted. The bonding between both the fabric and the glue is very important to keep in mind. Flexibility – It is very important to check whether the fabric glue is flexible or stretchable. If not, then they become hard which looks messy in your clothes. Resistant to Temperature – The adhesives should be resistant to high temperatures, humidity, UV light, and other environmental conditions. Drying Speed and Quality – Always look for the drying speed first. For example, you are going to a party, and you need to wear a particular outfit for that occasion, so choose the one that dries quickly. Some glues dry clear and some turns pale yellow after drying. The milky white or yellow colored glue leaves a stain on fabric and gradually becomes brown in color after a few days. So, glues that remain clear after drying are the best one. Resistant to Chemicals – The fabric glues must be resistant to different kinds of chemicals like diesel, petroleum, or any other fuels or oils. Easy to Use – Do not purchase a glue which is difficult to use with fabrics. Or you have to go through a number of processes for the application of the glue. Always buy the one which is quick and very easy to use. Type of Packaging – The fabric glues come in different types of packages. Some of them are available in tubes, some in bottles and some are available in spray cans. Most of the bottles are squeezed with an applicator tip. Just choose the best one according to your need. Environment-Friendly – Environment-friendly property of the glue is very important. Read the constituents of the glue properly before purchasing. It should be acid-free/toxic free and free of compounds like fluorocarbons. The toxicity level must be lower, or it should be non-toxic to inhale. The strong odor of the glue might irritate your eyes and nose, so always prefer the odorless glue. Washable – Some glues with temporary bonds and less strong glues get washed off or get weaken after wash. If you want permanent bonds into your fabric, you must go for the super-strong glues which can be washed by hands, washing machine and is also suitable for dry cleaning. Cheaper in Cost – A variety of fabric glues are available which are higher in rates. If you search properly you can also find those with all the good properties of an expensive one at an affordable price.